Hard to wear, and hard to recommend. Crazybaby nailed all of the hard parts, but slipped up on the basics of making a true wireless pair of earbuds. It's hard to recommend something that physically hurts your ears after 20 minutes. If you don’t know who Crazybaby is, I wouldn’t blame you. They’re a new company that rose to fame with by launching hugely successful crowdfunding campaigns for unique and interesting audio products, such as the Mars speaker which looked more like a UFO landing pad then a Bluetooth speaker. 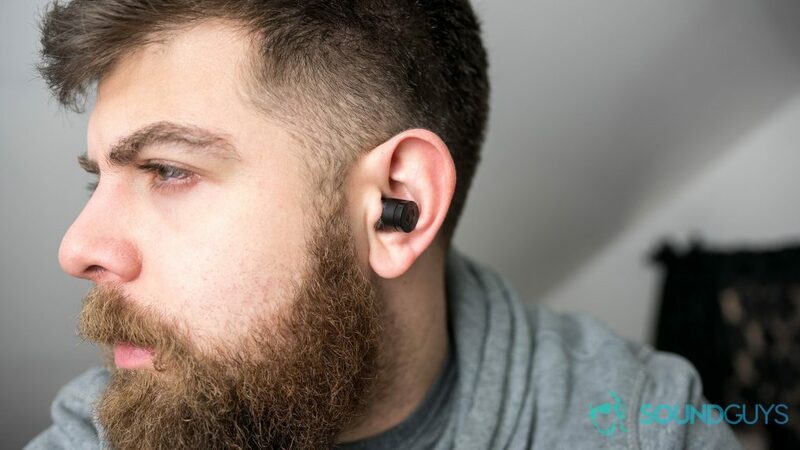 But now they’re also taking a stab at truly wireless earbuds, first with the Air and now with the Air nano. On paper these ‘buds look like they might be the ones to beat, but how are they in reality? They come in a plastic casing that looks almost exactly like an iPod case, and you get that same experience when peeling off the plastic. Inside you’ll get the charging case, the earbuds, three extra tips, two pairs of wing tips, a short USB Type-C charging cable, two Crazybaby stickers to swag out your stuff, and the warranty information and instruction booklet. The charging case slides open to reveal both earbuds tucked away inside. The first thing we should start with is probably the case, which is made of a glossy plastic not unlike the plastic that the Airpods case is made of. The only problem is that it doesn’t feel nearly as sturdy or seamless. Where the Airpods case click into place or flick open, the Air nano case has a bit of give to it mostly because it slides to open, and uses magnets to click the two sides together. Both of these combined result in a pretty annoying problem with the case. The amount of force required to pull the case open isn’t a lot, but it’s just enough to potentially send the earbuds inside flying all over the place. Pro-tip: Open one side at a time to keep them from falling out. Pro-tip: Open one side at a time to keep them from falling out. On the bright side putting the earbuds back into the case is significantly less annoying thanks to those magnets. Once you line up the tiny prongs on each ‘bud to the ones in the case, you can just drop them in and let the magnets do the rest. There’s also a tiny L and R to let you know which ‘bud to put where, but the letter in the case and on the earbuds are so tiny that if you’re in the dark you’re going to have a hard time figuring out which is which. More than once I ended up putting the ‘buds back in the case only to have to reposition them so they would fit the right way. And if that wasn’t bad enough more than once I thought I had them in correctly only to find two hours later that they weren’t charging. Or only one was charging and the other wasn’t. Turns out you need to keep messing with them until both lights on each earbud light up. Which is more annoying than it sounds, trust me. Unless you fit the earbuds perfectly back in the case, they won’t charge. Now if you were hoping to hear good things about the earbuds, I’m sorry to disappoint you. Because although there is plenty to like about the Air nano (which I’ll get into later in the review), the bullet design of the ‘buds is a hurdle I can’t seem to overcome. The flat end is both good and bad, and I haven’t had any issues with fit at all even without adding the included wing tips. These fit perfectly in my ears and because of that, they also have some of the best noise isolation I’ve experienced in any pair of true wireless earbuds. The problem is that in order to achieve that good fit, they basically push against the inside of your ear which I’m sure I don’t have to tell you, can get pretty damn uncomfortable after a while because of that flat design. It’s something that’s always been an issue for me with these types of earbuds. I’ve been able to max out with about an hour of listening time before by ears can’t take it anymore, but the comfort level drops drastically at around minute 20. It’s a shame because although it’s a fairly big issue to overcome, if you can overlook the discomfort you get a really solid pair of true wireless earbuds that I actually really enjoy using. They’re splashproof so you won’t have to worry about rain, and though I can’t find anything about sweat resistance the company says you can use these for jogging or exercise. But I’m a little skeptical with that claim because even though the water might not damage them, the salt in your sweat might over time. I haven’t had these long enough for that to be a problem however, so it’s just speculation at this point. This is where the Crazybaby Air nano earbuds really impressed me. In about a week and a half testing these skipped less than five times. Not bad at all. Crazybaby makes it a point to say that these use an advanced Planar Inverted F-shaped Antenna (PIFA), which to be honest means nothing to me as I’m not an antenna expert. But I can say that I believe their claim that these are rated among the best in the industry when it comes to connection. It’s exactly the kind of stable connection you should want from a pair of true wireless earbuds. The Crazybaby Air nano are called “nano for a reason. These are small. Okay now this is the part of the review where I throw a lot of codec standard abbreviations at you, so if you want to know exactly what everything means make sure to check out our full codec explainer piece. As far as Bluetooth streaming is concerned you won’t find any aptX or aptX HD support here. Instead Crazybaby opted for AAC so if you have an iOS device or any Android phone running Android 8.0 Oreo that’s what you should be aiming for. Any other non-compatible source device will default back to the standard SBC. The charging case can charge your ‘buds up another 3 times. When it comes to playback controls the Air nano offer a surprising amount of control (especially when compared to something like the Airpods). Each earbud has a button at the tip giving you access to different controls. The left earbud answers/ends phone calls with a single tap and activates your phone’s personal assistant with a quick double tap. The right earbud controls playback so you can pause or play with a single tap, skip to the next song with a double tap, and return to a previous track with a triple tap. They all work as advertised but it’s still a little annoying since every tap pushes the ‘bud into your ear like a tiny plunger. Like most truly wireless earbuds the Air nano’s aren’t going to blow you away with long listening sessions. The ‘buds have enough juice to go for 3 hours while the charging case will tack on another 3 listening sessions, totalling in about 12 hours of playback time. Of course that does depend on the kind of music you’re playing and the volume. At 100% we only managed to reach 74 minutes of constant playback (1 hour and 14 minutes). With angled tips these are great at sound isolation. So if you’re looking to use these on your next flight you might want to reconsider. Now if you’re going to be using these on your morning and evening commutes to the office you might have better luck as long as you throw them back in the charging case in between uses. On the bright side these do have a quick charge feature that pumps 90 minutes worth of listening time from the case back into the earbuds in just 5 minutes. Of course, those 90 minutes will most likely only be at low volume seeing as on 100% the headphones went from a full charge to dead in 74 minutes. Now I do have to give props to Crazybaby for making these charge via USB Type-C. It’s crazy to think that the new standard still isn’t being adopted in most of the accessories we buy, so I have to point it out when it is the case. The fit is perfect, but the Air nano hurts to wear. Now I went into this review expecting these to sound terrible, and I was surprised to find that they only sounded bad. You obviously shouldn’t expect to love the way these sound, but you also shouldn’t be getting a pair of truly wireless earbuds if you’re worried about sound quality. These kind of sound like Airpods to me but with more bass. The bass also isn’t super clear, and tends to be all over the place. When it comes to songs like “Friends” by Francis and the Lights, the low bass hits just feel overwhelming, which lends to an overall murky sounding low end. The mids and highs aren’t that clear either which I wouldn’t have expected. Roughly 2:45 seconds into the song “Generator^ Second Floor” by Freelance Whales where most of the instrumentation drops out the vocals still sound fuzzy when normally they’re clear as crystal even on not-so-great headphones. Similarly, the best that can be said about the highs is that they don’t distort. If you listen to the trailing end of the cymbal hits in that same song you they don’t really float away in the way I’ve come to expect. They just cut off. The charging capsule is made of shiny plastic similar to that of the Airpods case. The earbuds are small and well-built. I have to give kudos to Crazybaby because even though these don’t sound great and cause my ears physical pain, they’re so close to getting it right in a product that only costs $99. The Crazybaby Air nano have a spectacular fit, sick isolation, and a strong connection to boot. The case is almost on par with the Airpods and the earbuds themselves are resistant to water which is awesome, and those are all hard things to accomplish. Crazybaby nailed the difficult parts of making a pair of true wireless earbuds but slipped up on the basics. These aren’t comfortable. At all. Opening the case is more difficult than it needs to be, and putting the earbuds back in the case correctly is even harder still. Especially if the battery is dead and you’re trying to recharge them. Luckily I was testing them in the comfort of my own home at the time. But if I had a two hour commute ahead of me (which I used to have when going to school) and then opened up the case to see the earbuds weren’t charging, I definitely would be a little more than pissed.